My friend got a new pair of shoes, and not really having experience of shoecare I offered to give his pair a treatment I usually give my new pairs. The pair is from Loding, a good "entry level" semi brogue. My own pair of Lodings has been OK, but apparently doesn't really like water and has got some a bit weird damage from snow (that any of my other shoes have never had). So kind of mixed feelings about the quality at the moment. Anyway, the treatment. I usually give a new pair something to soften the leather first. 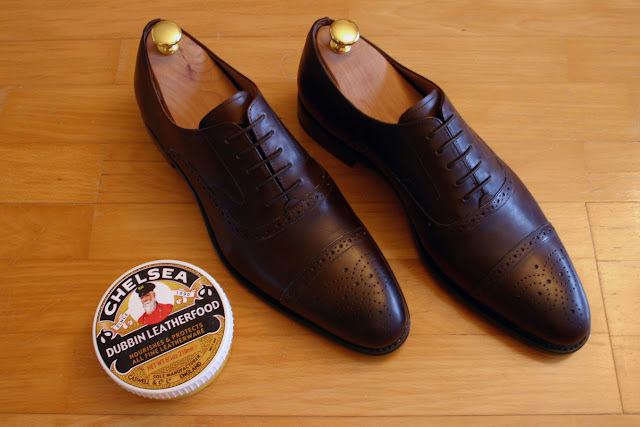 I use either Chelsea Leather Food (can be bought from eBay for just a few dollars) or Saphir's colored creme if I happen to have some in a matching color. Sometimes both. Here's how the shoes look like after the CLF has been applied. The good thing about the product is that it does not darken the leather nor does it complicate the shining process. As the pair might've been sitting on a shelve somewhere for a long time, give CLF or creme time to soak in. I usually leave it on for a night. 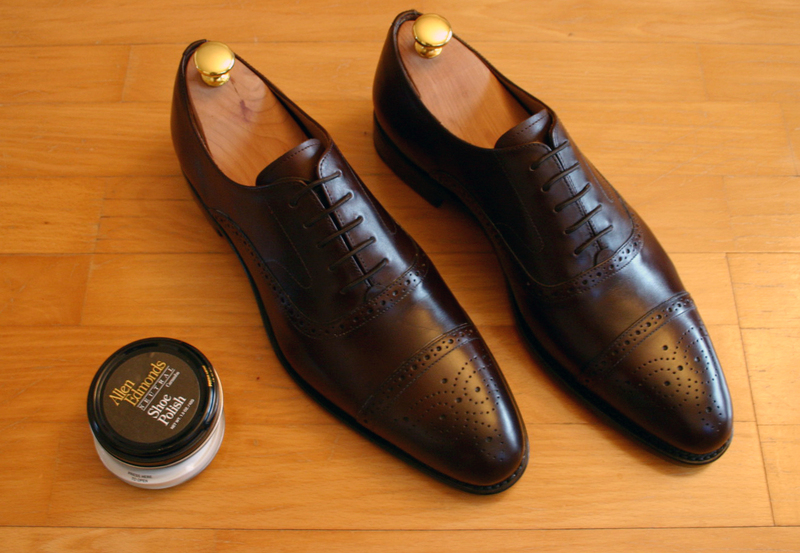 In the morning brush the shoes to get rid of the excess product. Then, either re-do the same process or go for the shine. I usually a colored wax, and sometimes add a layer of neutral on top. I have a box full of different waxes, some better and some worse. For this pair I simply added a layer of dark brown wax from Herring Shoes (don't know the manufacturer) that doesn't really give any super nice shine. Therefore, I applied another layer of neutral wax from AE that I've found to be a bit better in terms of shine. Sad to hear about the problems with the Lodings. I will try them out nevertheless, they have great last shapes for the price. I agree. Too much shine is just too much.